In a video that’s been going viral, Nash learned that having a dog isn’t always fetch and pets. Sometimes you get down and dirty. The poor kid has his first barefoot run-in with his dog’s business, and he’s not too happy about it. Turn down your volume for this one, as the boy is very vocal about his need for a paper towel. Welcome to the joys of pet ownership, buddy. 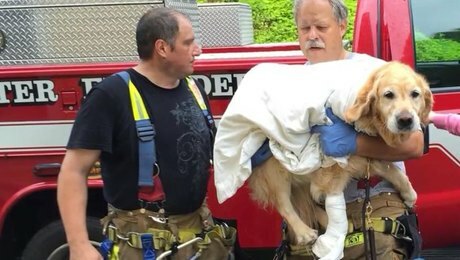 Before you read on, just know that the dog and owner are safe and recovering, so they’ll be fine. This week, DogTime reported the story of Figo, a seeing-eye dog who jumped in front of a bus to shield his blind companion from the impact. Figo, with an injured paw, hobbled over to his friend and stayed with her while medics attended to her. As I mentioned, dog and owner are doing fine, and an anonymous donor payed Figo’s medical bill. So don’t worry too much about this canine hero! Cookies the tiny poodle found her way back to her owner after being lost for five years. Jessica left Cookies with her sister in New Mexico when the military deployed her to Afghanistan. Then Cookies disappeared. She was found in San Diego, and thanks to a microchip, she was flown home to Kansas City to be with her owner. Jessica knew right away it was the same old Cookies, though her fur has gone a little grey. 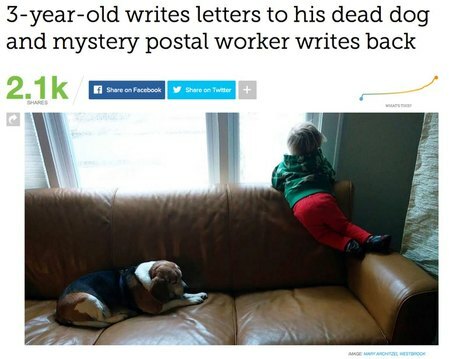 She’s been gone for 35 dog years, after all. 4. Canines In The Courtroom, Again! 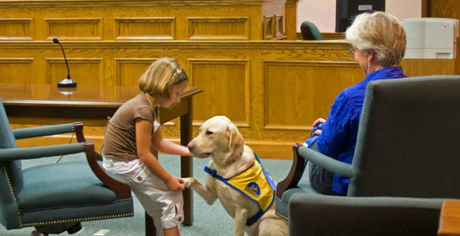 Last week’s roundup featured a story about therapy dogs being used to help calm kids in court. Well, for the first time, a New York City courtroom allowed a therapy dog to accompany an adult witness who had to give testimony of her traumatic ordeal. Paz the Labradoodle was ready for hugs and comfort, and helped the victim testify. He did a great job, and we hope this leads to more therapy dogs in the courts. Japanese scientists found that dogs will refuse food from people who are mean to their owners. This shows an ability to cooperate socially, which isn’t a skill that’s very common in the animal kingdom. Dogs are able to act based on their emotional judgments about people and disregard their own self interest. But if you read about Figo above, you already knew that. Now science knows, too! When Luke’s dog, Moe, passed away, the 3-year-old began writing letters addressed to the pup in “Doggie Heaven, Cloud 1.” After placing the letter in the mailbox, Luke’s mom would usually sneak out at night and take the letters inside. But after she forgot one night, she was surprised to see that Luke got a letter back from Moe. A kind person at the post office wrote back to Luke as Moe, confirming that the pooch was in heaven, playing all day, and that he still loved Luke. Excuse us, we have something sad and beautiful in our eyes. A video went viral on Facebook showing two Golden Retrievers in a nose-to-nose stalemate over a tennis ball. Neither pup gives an inch when a third Retriever comes in to play peace keeper. He rests his snout on the battling pooches, as if to say, “Come on, guys.” The adorable battle continued after the video despite the third dog’s efforts at levelheadedness. The epic tug-of-war could still be going on to this day. Google’s “dog” robot, affectionately called Spot, showed off some new moves, bouncing and hopping around on two legs while maintaining balance. Spot can also do some weird wiggles and stretches without toppling over. The robot’s technology will have plenty of applications in the future, but we’re looking forward to getting some robo-pets to boogie down with soon! A video has been making the rounds on the internet showing a Pitbull that can climb a wall just like Spider-man. The dog takes off, scrambling almost two stories up a vertical wall before catching his target. We’ve never seen a pup jump like that, but it’s a good thing one of his pals is around to catch him on the descent because it’s a long way down. No word on whether or not the Pitbull had a run-in with any radioactive spiders. A high school in Minnesota is recognizing two service dogs as staff member in the class yearbook. The pups, named Dakota and Carmel, aid instructors in teaching sign language and special education. The dogs are helpful in reaching diverse groups of students, and the school is happy to include them as part of the class. This is the fourth year they will be included in the yearbook. We want their paw prints in our yearbooks, too! That’s it for this week’s dog news. If you see a doggone story that we should feature next week, tweet it to me @MikeClarKent and you might see it in the roundup!